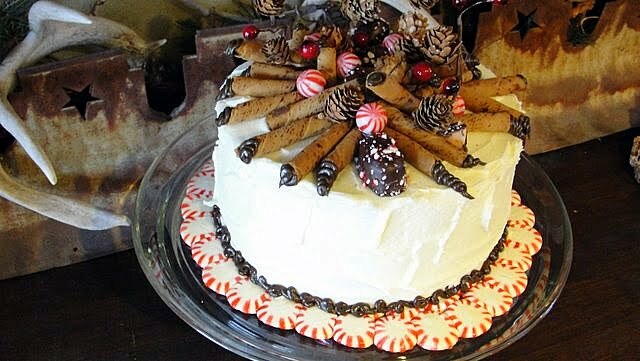 But this year- I was inspired by none other than Southern Living for the cake. 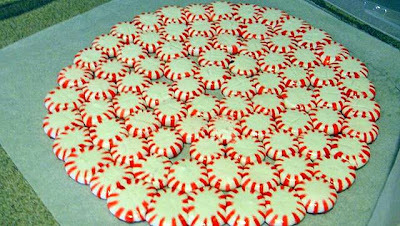 I made a peppermint candy base- the kids loved opening the wrappers and amazingly only about 3 peppermints were broken which made them edible at the moment! The rest were used for this project- and might I say- Thank goodness I purchased two bags as the first try was a big flop! I followed the directions to a t (which is typically not like me) and I had peppermint bubbly gooey going on. So the second time I did my own timing and came out with this. The idea was straight from Southern Living's December issue- I think I will use this for years to come! 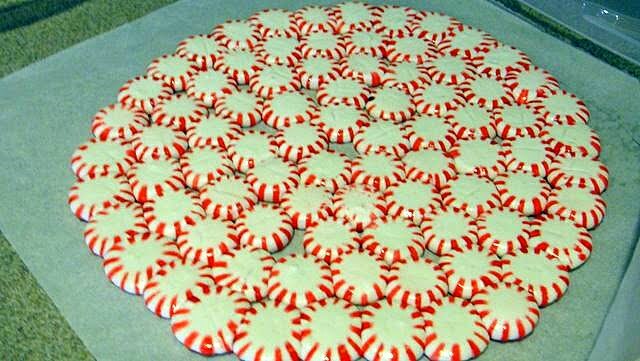 It took about 60 peppermint candies, unwrapped and spread into a circle slightly larger than the cake I baked. I put them on parchment paper in the circle shape and baked about 6 minutes at 350 till they were just starting to touch. Then I let them cool. I'm sure you could put your cake directly on this- especially a cheesecake- however- so that the chocolate cake wouldn't taste entirely pepper-minty, I chose to put a layer of wax paper (which I warned the host of) below the cake. This way only the edges would absorb some of the yummy peppermint flavor. I chose white frosting so that the topping would show up better than my dark chocolate frosting. I think cutting into a white frosted cake and finding dark chocolate inside is such a treat!!! 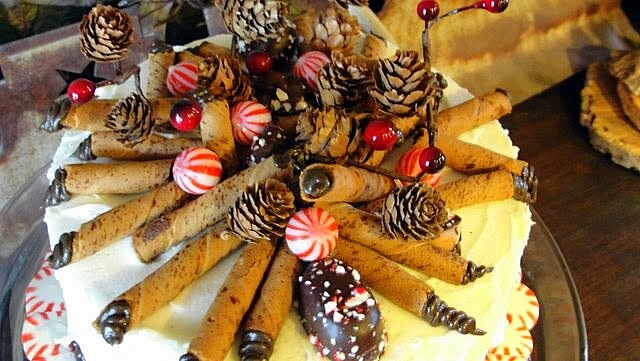 I bought holiday mint chocolate filled pirouettes (only available during Christmas) to lay around the top of the cake along with more peppermints , peppermint cream filled chocolate and some small pine cones with red berries to pull all the colors together. I was really wishing I could have been at that party- my mouth is watering thinking about it. The morning after the party a super sweet friend that was at the party texted me to say she was having my chocolate cake with coffee for breakfast- and in her mind- it doesn't get Any Better than That!!! WOW!! The cake is almost too beautiful to eat! I love chocolate and peppermints soooo the two together is great! I'm like your friend, cake with coffee...ummmm, so good! !